Polished Concrete Floors are one of the most economical, cost effective flooring alternatives out there. The reduced costs associated with saved energy, maintenance reduction, and especially the long-lasting durability shows concrete floors are a budget sensible, as well as beautiful, flooring system. Elimination of dusting from efflorescence. Unpolished concrete floors have tiny particles of dust being pushed to the surface called dusting, which greatly increases maintenance of unpolished concrete surfaces. Increased strength The polishing process hardens the exposed concrete surface, which makes it more abrasion and impact resistant. Increased ambient lighting. Reflecting visible light can greatly reduce the cost of lighting. In industrial or commercial settings, a polished concrete floor can save thousands of dollars per year in energy costs. Higher levels of co-efficient of friction than any coating on the market. Polished concrete most often exceed OSHA friction co-efficient standards, and is higher than unpolished concrete. What this means is that it is harder to slip on a polished concrete floor than unpolished, wet or dry! Elimination of Tread Marks. In commercial or industrial settings, polished concrete will eliminate tire marks from forklifts, utility carts, and other vehicles. If a forklift or vehicle burns out, turns sharply or is weighed down heavily, an impress or tread mark will be left on unpolished concrete surfaces. Polished concrete surfaces have no resins to burn on the concrete’s surface, thus eliminating tread marks. Reduction in tire wear and tear. 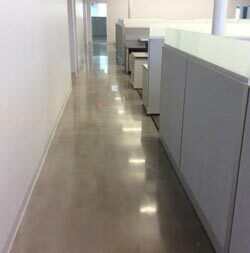 In industrial or commercial flooring, the smoothness of the polished concrete floor reduces the friction between the concrete floor surface and the tire tread thus resulting in less wear and tear. In addition, leveling the curing joints allow for a smoother surface reducing the potential wear of tires driving over rigid breaks in the unpolished concrete surface. Decrease in floor maintenance costs and wear on cleaning equipment. An unpolished concrete floor requires a great deal of force and scrubbing during cleaning which will wear on power equipment or mops, brooms or brushes. Chemicals, oil, or paint can leave permanent stains on unpolished concrete surfaces which can be costly to remove. Polished concrete does not require aggressive scrubbing. The polished concrete surface is so tightly compacted that it repels oils and other substances. Reducing cleaning time and maintenance will greatly increase your bottom line. Short down time during and after the polishing process. 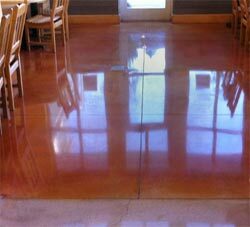 Concrete polishing is a relatively clean process using no toxic or hazardous chemicals. In many cases, the concrete polishing process can be conducted when your family is in the home, or while normal business operations are being conducted. This non toxic process is a great option for food manufacturing plants, hospitals, restaurants or other businesses where cleanliness is important. Many times, the daily operation of the business, and normal activity within your home are never interrupted. No need for stripping and waxing. 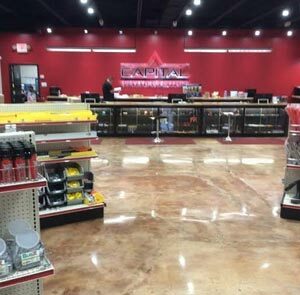 There is no need for waxing a polished concrete floor system. This is a HUGE time and resource saver since no additional products need to be purchased. They are beautiful. 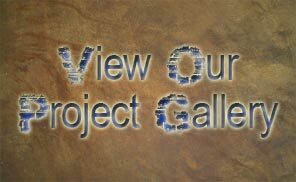 Polished concrete flooring is the top of the line in durability and beauty. Polished concrete can be finished to resemble costly marble flooring or travertine. The aesthetic properties make polished concrete flooring a viable option for homes and businesses alike. Longest-Lasting Floor Solution Available. No other floor system comes close to the durability and longevity of a polished concrete floor. In the event a polished concrete floor needs to be restored, a simple repolish is done at a fraction of the cost of a complete replacement of the floor. Polished concrete is a great alternative to brighten existing or new concrete surfaces. Whether you are pouring a new floor surface, or if your floor already exists, we can beautify your home or business with an elegant, easily maintained and energy saving polished concrete floor design that is customized to your desires. 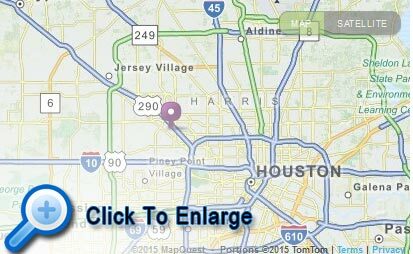 Fill out the information below, and one of our polished concrete design experts will be in contact with you, or call us at 713-682-8337 for assistance.